Nu metal and rap fans, heads up! 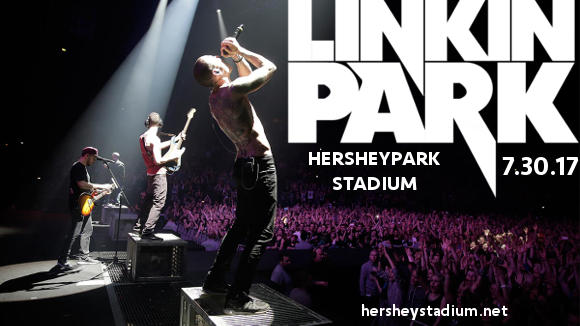 Linkin Park, Blink 182 & Machine Gun Kelly are to Hersheypark Stadium on Sunday 30th July 2017 for a massive night you’ll never forget! Linkin Park, Blink 182 & Machine Gun Kelly will be hitting the road again and serving up everything you know and love about Linkin Park, Blink 182 & Machine Gun Kelly – and maybe some surprises too – don't miss out!!! Formed by high school friends Mike Shinoda, Rob Bourdon, and Brad Delson, Linkin Park started out in Shinoda’s bedroom in 1996. After a few name changes and the recruitment of several new band members, including vocalist Chester Bennington, the band began to record songs for what would become “Hybrid Theory,” their breakthrough album, blasting them to the forefront of the alternative metal scene in 2000. Joining the band are Blink-182, the punk pop icons that defined the sound of the alternative rock scene in the 90s. Releasing “Enema of the State” in 1999, the band became well-known for their singles “Adam’s Song”, “All the Small Things” and “What’s My Age Again?” which received heavy rotation on MTV. Finally, its opener Machine Gun Kelly. Born Richard Baker, the rapper’s childhood and early adult life was difficult, but he found solace in his music and lyrics, and a growing fanbase with the release of his first mixtape. His mixtape “Lace Up,” pushed his popularity to all new heights, and now here he is, on tour with the biggest rap-rock group in the world!